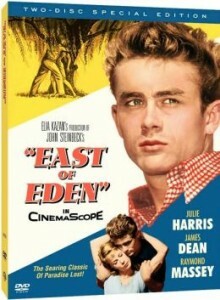 East of Eden (1955) is set in 1917, during World War I. It’s a tale of two brothers pitted against each other because one is considered good, and the other one bad. Paul Osborn wrote this screenplay, based on the John Steinbeck novel. Elia Kazan directed this masterpiece. Connect your VUDU account with Disney Movies Anywhere – access exclusive videos, bonus content, special offers, and reward points for all your eligible digital purchases. Cal Trask (James Dean) desperately tries to get his father’s approval but nothing he seems to do is good enough. Meanwhile, his brother Aron (Richard Davalos) appears to be the brother who does everything according to plan, including find a good girl (Julie Harris) to marry. While Adam Trask (Raymond Massey) seems to favor his son Aron, Cal comes up with a better way to help his father in his attempts to invent refrigeration. Cal learns that his mother, who he and his brother were told had died when they were born by their God-fearing father, is the owner of a brothel. Then Aron’s girlfriend starts to confide in Cal and they soon fall in love. This movie is one of the few gifts left behind by James Dean, who died way too soon. East of Eden gets four stars out of five. This entry was posted in Drama, Elia Kazan, James Dean, movie review, movies, romance and tagged Cinemascope, debbie elicksen, East of Eden, Elia Kazan, James Dean, jennifer miller-bender, John Steinbeck, Julie Harris, movie classics, movie review, movies, our movie talk, Paul Osborn, Raymond Massey, Richard Davalos by admin. Bookmark the permalink.